After the disaster that was our morning (see last month’s edition if you missed it…) we were finally on the road to the Murrumba Magic 100km. I had an awful feeling that we were going to have a terrible ride, I was not in a good place after enduring the terror of missing horses, my stallion getting caught in a cattle grid and a crazed call to the vet. Siri was safe and sound at home being watched over by my mother and sister, my dear friends were plying him with antibiotics and pain medication – and my husband put me in the car and started driving. I was the least fun person to be around that day. We finally arrived at the ride base, Jasmine and her dad and our friend Rob had found us a spot to set up our yards in the main ring. We were right next to my friend Tasha who was riding in the 40km with her mare Miss Jayne, her second horse was being piloted by Mindy in the 100km. The horses were soon fed and watered, the boys were setting up the campsite, we grabbed our gear and headed to the secretary’s tent to weigh in and nominate. Seeing the horses happy and eating after travelling so well, I was starting to relax. I still needed a bit more of a pick me up though, so I detoured by the Dixon Smith tent and bought a new helmet – yep, that helped….! Time to make sure the horses were ready to vet in. A little feed with their electrolytes and they were ready to go down to the ring. Sahala, Milton and Koda vetted in with HR’s of 29, 30 and 31 respectively and trotted out well – except little miss Koda who still hadn’t gotten the hang of trotting out, Erin wrestled her from start to finish much to the amusement of the vet! On my way to vetting I was approached by several people enquiring about Milton and sent them straight over to Rob. In November of 2015 I traded a pair of Renegade Hoof Boots for a crooked legged 14.1 hh Chestnut gelding named Kenny. He was 11ish years old and is a Morgan/Welsh Pony we think. It’s not entirely known, as he was bought literally off of the slaughter truck some years and a few homes ago; what’s undeniable is the magnitude of attitude packed into his little red frame, the smoothness of his gaits, and the high quantity of laughs that he has brought to my life nearly every day since. We’ve changed bits and saddles, been through steel and various trim, boot, and vet incarnations, been on Ulcer meds, and ridden a lot of miles both snarking at and enjoying each other. Last April we completed an LD at the Whiskeytown Chaser and this March we tackled our first 50 at Rides of March in Nevada. I had never been to the ride and was still half convinced Kenny’s wonky front legs were going to fall off partway through, but if you aren’t a little nervous you aren’t doing something awesome, right?! The final step in little Kenny’s prep for his endurance debut was a smashing clip job done last weekend by his former owner and our great buddy (and my trailer host for this ride! ), T. We had clipped Kenny last spring and it seemed to help him a lot, as he’s heavily muscled despite his short stature and has excessive yak Morgan hair. 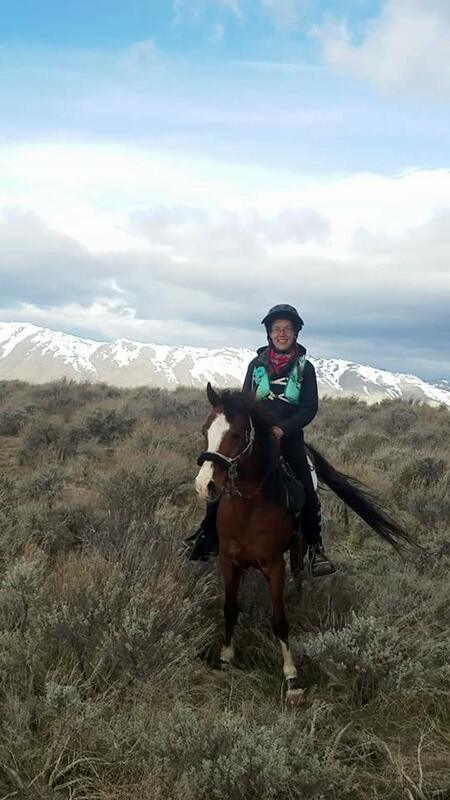 The weather for this ride turned out to be quite interesting overall, but on both Arab and Morgan we were happy that we had clipped as it allowed them to dry quickly from both their and the skies exertions. T picked us up Friday morning and we were all in good spirits, the horses looked good–and we went all of ten miles before an intermittent ominous WHOMPWHOMP noise started to cut off our conversation and cause nervous smiles and half hearted dismissals. If you caught my story of my first 100 Mile attempt from last month, you may be empathetic to the amount of NO EFFING WAY a DTN (Disturbing Truck Noise) this soon into this trip caused me. We did in fact pull over, peer under the truck, pronounce it a Truck with Intact Tires and Bits We Think, and continued on our way feeling worse and worse–until I glanced over my shoulder while under way and saw the grooming tote in the truck bed heaving itself up and around in an intermittent mini vortex behind the gooseneck hitch. WHOMPWHOMP. Rides of March might have been my craziest adventure yet. It's a long tale but quite entertaining. Started out with a peaceful drive to Reno. Took the exit for the ride and went 15 miles looking for a turn with ribbons onto a dirt road. Along the drive I had seen single pink ribbons on the side of the road. Get to the mileage, see a sign saying public land access and a cluster of pink ribbons and pink spray paint on the road so I turned. First big mistake. Rutted road with two high tracks to drive on and a ft deep ruts on each side and in the middle. Though this was weird but it was marked so will go a bit further. Now there's no where to turn around, I continue in hopes that this is correct or I will find a spot to turn around and I come to a big washed out looking section. Hop out to look at it and yep, can't cross that, back to the truck to recess. Second mistake, trucks running and Aria jumped on the door and locked me out. Nothing else to do but scream and walk up to the main road and look for help. Thankfully the rm saw my rig and texted for help, Wes and Dave to the rescue! They were incredible and Wes with a wood wedge and a wire clothes hanger got my truck unlocked and backed it down the road. Next bad decision, I didn't want the horses in the rig backing down the road in case it ended up in a ditch or got stuck. So unload and I had seen trailers taking the turn several hundred yards down from this road. Thought well that looks close, I'll just walk them over the hill to camp while the guys get my rig out. Dave says go to the cattle guard, take a left and it's a mile to camp. Ok, off we go, take the left and a little walk. Nope! I was supposed to turn hard left and I took the middle trail and went 90 degrees left. After about 5 miles I made it to the top of a ridge and was heading in the direction of the main road as I knew I was lost when flying to my rescue again... comes Dave in the razor. He tracked my footprints through the desert! We made it down to the jeep road the ride used and then I sat on the back of the razor and held on to the horses as they flew along trotting back to camp behind us. Then to find my rig in camp. I'm so frazzled I can't find it and actually start to wonder if I am crazy when nope it's down the road and didn't make it quite to camp. Off Dave goes again, did I mention Dave Rabe is incredible! Delivers and parks my rig and were finally settled. I made it to the area at 12:30, it's now almost 5pm. I had plans to go for a short test ride as had lots of new gear but no time now. So the insanity is done right??? No again. Morning of the ride and tack up and get ready. Think I should hop on and test my stirrups as I have only ridden in this saddle twice (I had been riding in another model owned by a friend and had just bought this one new sized for Apache) have new stirrups leathers, new fuzzies and a new girth. Hop up, he takes one step and immediately launches into the air bucking. I stayed on for one buck then fly off of course landing on my bad hip as always. I lay there and watch him continue to buck, Dave catches him and he still bucks a few more times in place. Side note: Dave was there the last time I fell off at Death Valley and caught my horse lol. The guy watching the whole thing said wow, for a little horse he can really buck. His forehead was almost touching the ground and his hind legs went straight up. It's the girth, all that caused by using a split girth that the back strap sat 2in further back than a normal girth. That was my third really bad decision. I knew Apache had flank issues. He gets really nervous when I take my feet out of the stirrups. Poor guy was scared out of his wits and shaking. Maybe this time the impact of hitting the ground will knock my brain back in my head. Changed out his girth and hoped on and he's just fine. Not a single naughty behavior all day. SO the GOOD NEWS is the ride was a success!!! Apache successfully completed his first 50 which was tough as was true GPS mileage and sand the whole way. He finished with a pulse of 56 and overall vet out with an A. As his longest previous ride was around 20 miles I was super impressed with his toughness and willingness to go all day and leave camp 3 times. He looked a bit shocked and dazed at the end not sure what just happened lol. Now for some peace and quiet at home. No adventures for a bit please! I’m freshly back from my first 100 mile attempt at the 2017 20 Mule Team Ride based out of Ridgecrest, California and I couldn’t be more amazed at both human and animal perseverance–and my desire to sign up for another 100 miler as soon as possible. If that has you wondering about possibly smooth travels and a successful ride completion I must immediately burst your bubble and instead urge you to settle into a comfortable chair with some popcorn and prepare to read a winding tale of Things Gone Wrong, Everywhere, that still ended with big smiles, hugs, and the desire for more.